7 vendors have this plant for sale.123 members have or want this plant for trade. I'm from Kitchener, Ontario, Canada - Zone 5. I love Old-fashioned bleeding heart (formerly called Dicentra spectabilis). In fact, seeing this plant for the first time is what really sparked my interest in gardening so many years ago!! I'm pretty sure to keep your bleeding heart from going dormant in the summer is to keep the soil a little bit moist (not wet, just moist - it likes woodland conditions) throughout the summer. I just dump a little bit of water on the soil most morning's from my dog's water dish, to try and create damp woodland-like conditions. It's Sept 10 now and my bleeding heart is still standing tall (3' by 3'), however it is yellowing now and has been for a few weeks now. This is one of my favorite plants for a shady spot. Even after the flowers are finished, I think the plant's form and foliage are still beautiful. I have mine planted in good, rich soil near the back of the flower bed in between 2 small azaleas. I've had no trouble with pests or diseases. I'm right on the border of Zones 7b and 8a, if that helps. I received a specimen of Dicentra in a plant swap from a young mother whose colony of bleeding hearts was rampantly spreading. It had not been divided or reined in for many years. The piece I transplanted was very successful immediately, no waiting for blossoms. It is located at the base of a deciduous tree and a nearby large shrub, in 3/4 shade. It also benefits from being at the base of a slight incline, bringing adequate moisture to the area. I like Dicentra's spring show of delicate blossoms. I have not been lucky enough yet to catch the seeds before they are dropped. It does disappear in the heat of summer but is totally forgiven for this behavior in light of its earlier beauty. A fantastic perennial for deciduous shade in the north. 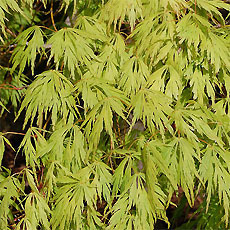 Generally goes dormant when the weather gets hot, though in moist shade in the north the foliage may stay in good condition as late as September. You can cut this down to the ground any time after flowering is finished and fill the gap with annuals, if you're careful to avoid damaging the brittle roots. I find occasional self-sown seedlings. 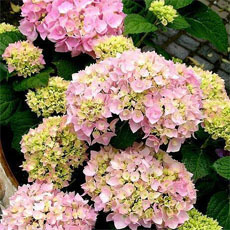 The white form comes true from seed if isolated, but is less vigorous than the pink. If you pick a flower and turn it upside-down, you'll see why this was once called "lady-in-a-bathtub." This species does not like the hot humid summers and brief winters of the US southeast, and is often unsuccessful south of Z7. Those reporting rebloom and those report... read moreing long-term success in eastern N. America south of Z7 are most likely describing a different (native) species, D. eximia or D. formosa or one of their hybrids. All members of this genus are called bleeding hearts, and this species is distinguished from the others by the common names "showy bleeding heart" or "common bleeding heart." Easily propagated by division when dormant. The roots are fleshy and very brittle, they dry out quickly. Include at least one dormant bud on each division. I absolutely love this plant! The only problem I have is planting them from bulb form. The fleshy roots tend to be very brittle and I find the more they break, the less likely the bulbs are to sprout. I started with 8 and only one sprouted. Fast forward about 5 years and my one pink bleeding heart plant is massive! It looks stunning in my shade garden among the ferns. I decided to buy my mother a red flowering variety for Mothers Day and I hope it does as well as the pink one has. Very successful plants here! I have a white, a pink & a red! All do well, they are in mostly shade with some light morning sun. The pink has been transplanted nearly half a dozen times! They rebloom often when we have a cool damp season. The Red is my fave. does amazingly well on the northeast side of my house in Kansas. My dicentra is about 2 ft. in diameter and blooms 2x a year, spring then fall. consistent moisture is key, along with shade from the little redbud tree adjacent to it. We have one in almost complete shade on a slope surrounded by pachysandra and do nothing for it. It has flourished with our benign neglect! We have another one in a flower bed that gets more sun that has been setting out seedlings and spreading. They put on a lovely spring show of flowers. Ours are not vines. They're almost like tender shrubs with no woody growth, but impressive spread-- to almost 3-4' wide. My favorite shade plant, Bleeding Hearts are an elegant "must-have" for the northern gardener. My mum has two enormous Bleeding Heart plants, and mine are getting bigger with each year. Mine are planted along a boarder hedge which receives shade and dappled shade until evening, when it finally gets some sun. I always look forward to the blooms each spring. I highly recommend this plant to anyone and everyone whose summer days aren't blistering - as they will wither and die in hot, direct sun. It took us a while to find just the right spot for our bleeding heart - a cutting from friends in Boca Raton. Once we planted two specimens on either side of an arch in our sunny back yard, they took off. The only thing that stops the blooming (which occurs in cycles throughout the year) is our rare freeze - just like this year (2010). I've cut them back to the ground and fully expect that they will rebound. This is a lovely vine (although with no tendrils, it does need a little "encouragement" to twine around our arch) and blooms repeatedly for us. We had such a nice thick set of vines last year that cardinals built a nest and raised two young at the apex of the arch. I ordered 2 from SpringHillNursery.com and planted them next to each other in a shady area (zone 7b). One came up nicely and the other, not at all. The one that came up had flowers right away. SpringHill is supposed to be sending a replacement for the dead one. My trick to keeping dicentra spectabilis looking decent year-round (at least in northern climates) is to cut it back hard after it blooms. Cut the plant back by about 2/3rds to the fresh basal growth. If this is done early enough, you'll most likely be able to avoid the summer dormancy that makes d. spectabilis look ratty from July on. By cutting the plant back, I've even managed to get a few stalks to rebloom in the summer. Those who know the plant are usually pretty impressed to see mine blooming in mid- to late-June! For what it's worth, I've also had the best luck with morning sun and afternoon shade. The biggest and prettiest plant I ever grew had a north-eastern exposure and was up against the foundation of our house. I love bleeding hearts. They add color to my shady spots. I have 3 of these...2 pink and 1 white. The one pink I've had for 3 years and transplanted 3 times, every year it's come back bigger and better. The other pink and white I just got and have high hopes that they will do as well as my first one. A beautiful plant, but doesn' t really flourish in the mild winters of Athens (i think it needs cold frosty winters like Peonies). It usually flowered in the first year, but then it gradually died. Also, it never grew really tall as it could. My summer is extremely hot, but i 've seen it thrive in the continental climate of Northern Greece (zone 8), despite their very hot summers. I bought a 2 gallon pot this spring, and the plant grew so well in my partially shady, zone 5 location that I have had to cut it back twice so far, and it has only been planted for 3 months. It is still sending out flowers on a regular basis, and it is August now. Only problem that I have had is that the plant was forked at the base, and split one windy afternoon. I staked the broken half, and so far 3 weeks later, it looks quite healthy. I'll post next year with an update. I too have tried this beautiful plants in my garden multiple times. I finally resolved, the summer heat is too much for these beauties. I would say this plant is difficult for a beginner - many may die because of bad locations or not watering it regularly but a few will success - the main thing is to keep watering - the first few plants may take years to flowers - the more you add, the more they will self seed and becomes more of a weed than a perennial and blooms quickly from seedlings as they resent transplanting so will sulk for a few years (3 to 4 years for me) but flowers in 2 to 3 years from seedlings if left alone. Their seedlings which I sometimes pull because of their weedy habits and difficult to move comes up with two seedleaves and then they have trifoliate for their first true leaves. The taproot is generally single and orangish brown. After that they will grow rapidly and by the second year they may be mov... read moreed for those who have too short springs leading in hot summers. I have found recently that at least one big patch had died - only one little plant survived - another patch that was huge died some years ago under mystery conditions - I think it is a disease - maybe fungus - there are so much undecomposed remains that it gave me a bit of difficultiy planting new plants - I saw black raised spots on the remains of the root sections - fungus but could be just feeding on the dead cells. I planted two of these wonderful plants in my front shade garden - one in 2006 and one in 2007. They are both thriving and have bloomed well into the summer. They have required, nor recieved, any special care. 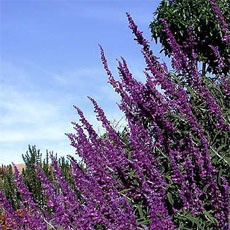 I want to divide them and plant some in the back of my yard, but am a little worried about harming the original plants. It would be a shame to lose what has easily become the highlight of any of my gardens! This is the 3rd year for this plant and each prior year, I thought it died. However, each spring it comes back bigger and stronger. No flowers yet that I recall. It is planted in full shade, with pH of 7.3 to 7.6. I'm still hopeful. Plated in shady area, though that they weren't doing well because of the conditions and just replanted in my backyard. Didn't think that they would even regrow. To my amazement, they are currently growing at great speed. Also planted in an area in my front yard then I thought that it might be too hot there because it gets full sun. Thought it would not grow back this year. Was going to replant somewhere else. Changed my mind when it came back this year. Not big right now because it is still semi-cold here. But grows great no matter where I put it. I first saw this plant at a friends house and fell in love with it, that was in zone 7A. I purchased some for my zone 7A for my front walkway, it gets some sun in the afternoon and has greeted me daily with the lovely hearts for a few years now. Just beautiful and no trouble to grow and I neglect it. I bought a huge bare root bleeding heart from easytogrowbulbs.com and I planted it about a month ago. Now it is blooming already! It is the first thing to bloom in my whole garden (early Feb.), and it is so beautiful! I bought 2 of bleeding heart vines last spring. Kept them in pots in a partial-shaded area and both did very well with growth but they did not bloom. I wasn't certain if I should be expecting blooms for this season since the plants were young when I'd bought them. Right now they're in the basement and new growth are sprouting. Its a lovely flower but the foliage goes dormant in summer, here in northern CT by mid june- its completely died down to the ground. Remeber where that plant was and dont go diggin it up and calling it dead- cause it might be back. I have had bleeding hearts thrive in the past - but they were planted in full sun, although its known to be shade plant. my neighbors also have this thriving as a full size plant in full sun. I planted 3 last year in a shade garden - so far only 1 returned. I just bought this plant, a dormant root, and placed it in my new shade garden underneath a large elm. That was in August - I know that it is supposed to go dormant after spring, which is why I am surprised that it is growing NOW. No buds or flowers, just stem/leaves (about 6 inches tall right now). I hope that the winter frost is not going to do any permanent damage since it is growing out of season. Anyway, I think it should be very well adapted to my climate, and I hope it doesn't become too invasive (though I have some friends to share with). In Augusta, Georgia, I have tried with three plants. One is barely surviving, no blooms. I think it doesn't take heat well -- certainly not the 100+ degrees of a Georgia summer. It is early July in southern California and my lovely plant has been sleeping since May. I surely do hope that it is a sleeping beauty and will awaken to the kiss of springtime again next year. This is my first attempt at trying to nurture this plant. On of the most unusual plants I've ever seen...one of those things more special than fiction. When I was a little girl the house up the street from us had a bleeding heart plant and I thought it was the most beautiful thing in the world, I used to sneak up the street to look at it through their old iron fence, it was so delicate and the colors was wonderful. Now I have my own and I love it. I have it in the morning sun and afternoon shade and it has thrived very well from a little stick two years ago. The pink one lived but the white one died. I'm going to plant two more in my shade garden and see they do. The pink seems to do much better then the white, tougher stuff I guess. I do love mine, easy to grow and much reward. I bought one of each color three years ago and they are still the same size and they've only bloomed once. I have them in light shade and are watered regularly. My dicentras are as happy as clams at high tide, despite the non-acidic, nitrogen-poor soil and their continued exposure to the herbicide-laden leaves from Ailanthus altissima. They are in a shady spot and in this Zone 6 they do die back in July from the heat. But in late spring, they're incredible. I've had them for 7 years now, and they get better every year. I have tried without luck to grow Astilbe and Hostas in this same spot. The Hosta struggles from being snail-bitten and the Astilbe can't handle something in the soil. I have a sunless wet corner where the house and the addition meet. I picked up this plant as an afterthought because they said it would grow well in the shade. This is the beginning of the third season, the weather here has been yucky and cold almost through May. We've managed to get our 1st whole warm week, and nothing has managed to grow yet except my coral bells and hostas. Last summer we got a new puppy and the dogs DESTROYED this poor plant. Yet, I went out to see if it had started sprouting the other day, and it's already a good 2 1/2 feet high, 4 feet across, and flowering! It sits in the worst place in my yard and it's the best plant I have. My husband even leaned the old sliding glass door screen over it against the house! I'm going to try to spread it down the rest of the shade b... read moreed soon! Well, the same, everybody has to add: Not too much shade, not too much sun, a little bit of a diva.... When established, keep weeds or other "Aggressors" in check, and you'll have one of the most beautiful and easy to care for perennials! Loving it! HIGHLY recommended! You'll need a cold winter, though.... I guess, it won't do too well in the warmer areas! Die back to the ground in the summer heat. Sprouted back, blooms first, no foliage whatsoever at the end of winter/early spring, the foliage soon follow. A very cute plant. The blooms are a hit with young children. I love it! I've been growing Bleeding Heart (Pink variety) for many years. I've been growing the White one for several years. I let them go to seed and I get free volunteers! I get so excited to see the new ones! They are both (Pink and White) so beautiful and wonderful in the Spring! A joy to see, smell and to touch! I have a few 'new fashioned' Bleeding Hearts too (with the fringy leaves), as well as the 'old fashioned' Bleeding Hearts. This is a lovely, interesting plant. As one other person noted, I too have had it die back completely in summer, especially during drought periods -- however, it always comes back the next spring, even though it appeared to have died. So don't give up on them too early! Somone else mentioned that when they die back, they leave a big empty space in the garden. I recommended planting them with astilbe and ferns like I did -- those plants are slower to start in spring and are getting larger as they bleeding heart dies back, so they hide it and then fill in the space it leaves. Plus the different textures of the three look very nice together. Mine is growing in a fairly shady area that gets a little bit of filtered sun. It's growing beneath a huge Cornelian Cherry Dogwood and right agai... read morenst my front porch, which stays in shade all the time. Its gorgeous blooms come at a time when most other things aren't blooming -- such a welcome sight in spring! You don't have to pay alot for them -- I got mine at a grocery store. It gets larger with more blooms each year. Highly recommended. My 92 year old neighbor just had her yard landscaped. 2 bleeding hearts were installed and have begun to look peakish and yellow. I heard about DG and decided to sign up and check it out. It looks like she has normal plants in NJ. We had a hot spell in late July, and I think it took it's toll on her plants. I will let here know that DG had good information! We'll be patient and wait until next spring to enjoy the plants when they bloom again. SQ. I have about 30 of these plants in my yard. I have noticed the white variety stands up to summer heat a lot better than the old fashioned pink variety. Mine grow fine just about anywhere in my yard. Some are even growing in sand between my patio blocks. The older plants tend to die back completely early once it gets too hot but they always come back the following spring if the ground isn't disturbed. They grow very well in shade under pine trees. Once the plants are established drought will not kill them easily. Young plants should be watered more often. I have a bleeding heart planted in a shady garden right under a tree. It puts on a spectacular show in the spring and is a sight for sore eyes after a long winter. It does get a bit unruly after blooming but I start to trim back the foliage in late May/early June. I plant impatiens underneath the plant because by July the bleeding heart has pretty much died back and gone dormant. It's neighbors are lilly in the valley, a pink astilbe, hostas and a fern. As the bleeding heart begins to die back, the astilbe goes into bloom giving the garden its second show. Planted this little beauty in a shady spot in my backyard last year. It grew beautifully and blossomed then something chewed through the stalk and it was gone. Was going to buy another to replace it this spring but found it was coming up again. Sure enough something ate it again. But it's a fighter. It has come up a second time this spring. It is now about a foot tall and doing great. Guess as long as nothing happens to the roots it will keep coming back. This puts on a big, dramatic show from April to June here and it is amazing and beautiful, BUT it spreads like crazy and after it is done blooming, the foliage, which I don't find all that attractive, remains way too long and starts to get a little funky. Then it dies back for the rest of the year and I have a very conspicuous bare spot. Spokane, WA garden, she even potted them and grew them as a house plant in a sunny window during the winter.. I'll always remember she called them "Lady in the Bathtub" plant...if you take a blossom and invert it, gently pull apart the two outer petals and you'll see why. So I now live in Sammamish WA and Iv'e got about a dozen of very healthy Dicentra here and there in my yard, quite a variety actually. Evey time I walk by one I remember my sweet Grandma that makes them very special to me.....OH and my grandchildren are as intrigued by "Lady in the Bathtubs" as I was as a kid! Success on my seventh attempt to grow this plant! 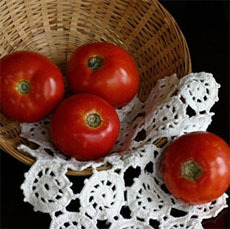 I grow them in memory of my grandmother, who could always make things grow just by looking at them. She had them in a wildflower garden in Massachussettes, with paph's and some other hard to grow beauties. This is the first one I have ever gotten to bloom, much less to leaf! I am so excited! It grows on my front porch in a container, gets partial sun in mid afternoon, and is well watered. The first blooms are a little scrawny, but I attribute that to either the first bloom or young growth that has not reached its full size yet. If it really is invasive, as I have read, then I will rejoice, and plant it everywhere, in the hopes that it will choke out the Nandina which is driving me insane. For those of you who... read more have problems with it, my suggestion is to keep trying! you CAN get this plant to grow I promise! Just keep trying, it is well worth the struggle. This plant was one of the first perrenial that I planted next to my bench when I moved to my home 11 years ago. It is absolutely stunning at its peak. It does get ratty once it becomes very warm but the plant goes dormant in the summer. At that point, I just give it a hard cut and my other flowers are there to take over. I do wish this plant was invasive in my yard as the previous writer......instead I get creeping charlie amongst other less desirables. I have found that this plant grows in my area (southern Indiana) much better if it has more shade then sun. I planted it once in part shade/sun and lost all but the roots, but then planted it next to my deck under a tree with more shade and it is doing wonderful this year. 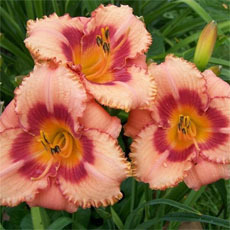 It has doubled in size and the flowers are perfect, no problems with the leaves either, moderate water. I transplanted 2 small, spindly bleeding hearts from a friend's shady back yard here in Worcester, MA, where they were growing more or less wild between the rocks of an old stone wall. I tucked them into a shady corner of my own yard and they grew beautifully into thriving bushes with very little fuss or special care -- my children love the heart-shaped blossoms and the little "crystals" that hang from them. They come back vigorously every spring and bloom until June. They're a very easy and very rewarding plant to grow. I bought one last spring at a small store, and brought it home and planted in a shady spot on my bank in the shade, behind a heartshaped sandstone, and this spring, it is taking off beautifully. It's only about 12" high, but hope for it to grow bigger. I live in New York City and have a very small garden in the back of the building. In the shady nooks of my garden where nothing else has been able to grow this plant thrives. I bought one plant at a Farmer's Market 3 years ago and have been able to divide it each year to fill in another spot. It dies off (pretty much completely) during the summer... but what a great feeling to see it push back the soil in the spring each year. This is my absolute favorite spring bloomer. Mine is planted on the north side of a garage so it gets enough water running off the roof to live all summer. It reseeds better than the white ones. I've had mine since 1988 and they're huge! Easy; hardy; self sews; loves shade; hates 'wet feet', Nice! The may be the easiest perrenial I've ever grown. I planted two cuttings in an Azalea bed, and I haven't done anything else except water when it gets really dry. I love bleeding hearts. The flowers look more like a little girl's charm necklace than a real, living plant. It is just so fascinating. They may die back in the heat of summer, but come back in spring. Stratification in a moist medium aids germination of seeds; they are slow to germinate. Blooms April-June in my garden. I love this plant, but have tried 3 different plants in 3 separate locations and can't grow it. A lot of plants are listed that they will grow in zone 7, and the summer heat kicks in, and they die, no matter the water, shade, etc. I think it's too hot for this plant here. Very impressive while it's with you- as one other poster said they can get to be about 4 feet across- but they do leave an awful hole in the garden when they go dormant for the year. I stick a couple of containers full of annuals in the space they leave. If you don't like the empty space you might try the smaller D. eximia. Mine stay all year. and you get a choice of pinkish or white flowers depending on the variety. I would recommend spacing them farther than is listed. Once established, these can have a lateral spread of 4' or more, and mine are crowding each other significantly. Most impressive spring plant in my garden. Does die back by mid-June, though I've yet to find a good plant to fill the space. Establishes quickly, though may take a few years to reach full size. (plants referenced are in clay/loam soil in partial shade under deciduous trees and get watered regularly with the rest of the bed) It seems that plants with more sun will last somewhat farther into the year than those in shadier locations. In my area, this plant grows well in shade and moist soil. After having this plant die back last year, we thought for sure that it wouldn't come back this year. Well, lo and behold, it came back with an explosion of leaves and little bleeding hearts. 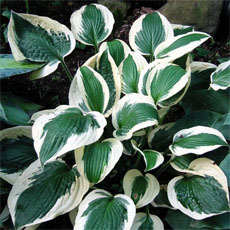 It's planted in the shade with some lovely hostas behind it, the color offset (and the leaf size offset as well) is very pretty. I planted one in February, did quite well, quite large, can't wait for next early spring. Another just came up last month, waiting to see what it will do. We have been at our home for 1 year. I have two bleeding hearts growing on the south side of my house, under the shade of a big pine tree. I bought them 2 years ago from a local greenhouse when they were just tiny little things. Now they are HUGE!! I'm very happy with them! 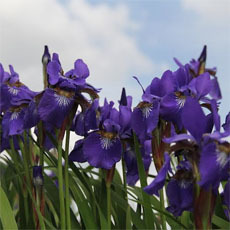 They are the first flowers to bloom in the spring (end of April) and they re-bloom throughout the summer. Hummingbirds buzz around them occassionally. Our soil is heavy clay but I give them lots of compost in the spring and cover the beds with bark mulch. I've had no problems with them--very easy to care for. I have attempted to grow this plant 2 different years with no luck. After trying everything to please it, I gave up. My zone is listed as an area in which it will grow, but maybe it is just too hot for it. Dicentra (from the Greek words dis, meaning “two”, and kentros, meaning “spurs”) are spring blooming. Generally, the cooler the location, the longer the blooms will last. This plant is native to Northern China, Korea and Japan. It was introduced in England in the mid 1800's. 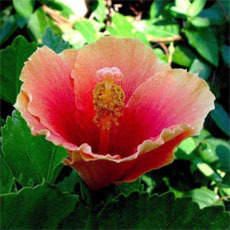 This classic plant features pink heart-shaped flowers with a white stamen protruding from the bottom. They form an arch of "bleeding hearts" on a branch that sprouts out from the greenery beneath it. There are many new types of bleeding hearts available now in various colours... (white, gold, red) but this lovely lady is a classic. This plant prefers to be in the shade and in cooler climates, but can survive in hotter climates if it is kept moist constantly. It is na... read moreturally dormant in the summer, so the cooler the climate the more likely it will bloom. This is a lovely plant that I planted in a border that receives nice mid-morning sun and shade the rest of the day. It loves the location and returns bigger and stronger each year. Unfortunately, it does not last much beyond early June no matter what I try to keep it going. I grew it in Southern Connecticut in full sun and it lasted a bit longer, but it was gone by mid-August. If you plan to move this plant be certain to get ALL of its brittle, fleshy roots. I must have missed a piece (thought I had checked carefully) and found a new plant growing exactly where I didn't want it this spring. I would say Common Bleeding heart transplants very easily. The original plant (2 years old) was relocated to an area in deep shade where it grew to 48" high and around. Grows well in my shade garden. Plant is currently 3 years old and about 2.5 ft tall by approximately 6 ft wide. Will divide next spring. This plant grows in my garden under medium to heavy shade in well-drained, composted soil. It seems to thrive there, but dies back when the summer gets too hot. It loved the extreme cold we had this last winter here in northeastern Connecticut and went nuts this spring. It's a 2-year old plant and already is about 2 1/2 feet wide by about 3 feet tall. It's quite spectacular. I have had success with this plant in a full sun location, in sandy soil, by keeping the soil moist at all times. I don't know much about this flower. I live in Washington State, and it was in my backyard when I moved in. It is beautiful, and I wasn't even trying, lol! Drought sends this plant into early dormancy; prolonged wet soil makes it die. Best in that infamous "moist, well-drained soil". Bleeding-heart can easily be the most breath-taking showstopper in the garden when in full growth. It also makes children avid gardeners. Bleeding Heart, grows well in cool climate in Southcentral Alaska. The shoots start to pop up through the mulch sometime in April, and we have blooms in June. The plant never dies back in the summer and continues to bloom, though not as profusely. Last spring I divided my 6 year old plant, leaving a large healthy section in the ground. I potted 26 gallon-sized pots and replanted another large plant to another bed... all from my 6 year plant. Grows 24" to 36" high, and 18" to 24" spread. 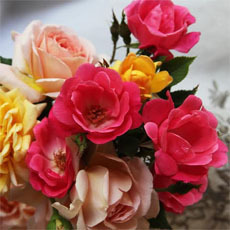 Flowers are heart shaped and usually pink, although there are white, red, purple, and yellow varieties, as well. The white species 'alba' comes true from seed. Flowers in late spring to early summer and dies down to the ground afterwards. The leaves are very graceful. Best cultivated in light shade, humus rich, well draining soil. Propagate from division or seed. They don't flower well or grow well without a period of winter cold. Hardy zones 2-9.